The kitchener stitch is a way to graft live stitches together creating a seamless join. It’s often used to close up the toes of socks or shoulder seams, (among other things). 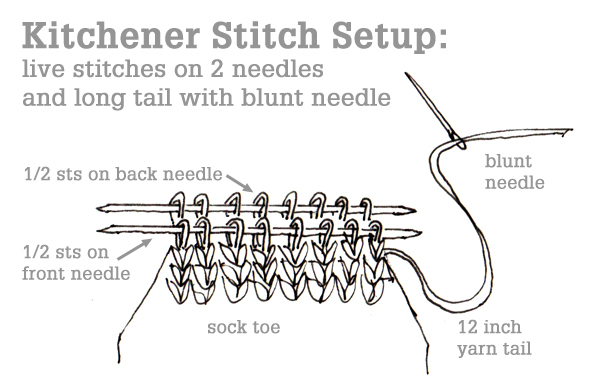 Although it is possible to use the kitchener stitch to graft ribbing or purl stitches, it is most commonly used to graft two pieces stockinette stitch together. Setup Step A: make sure your stitches are on 2 needles and wrong or purl sides are facing each other. Setup Step B: thread your tail (or some new yarn if you don’t have a tail to use) on a darning needle. Setup Step C : put your darning needle through the first stitch on the front needle as if to purl and pull your yarn through leaving the stitch on the needle. 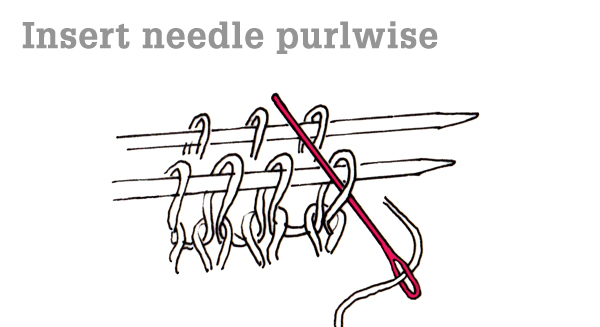 This illustration shows how needle is inserted in a ‘purlwise’ direction – it is shown on the front needle for clarity, but it works the same on the back needle. Setup Step D: put your darning needle through the first stitch on the back needle (being careful not to put it OVER the needle) as if to knit and pull your yarn through leaving the stitch on the needle. 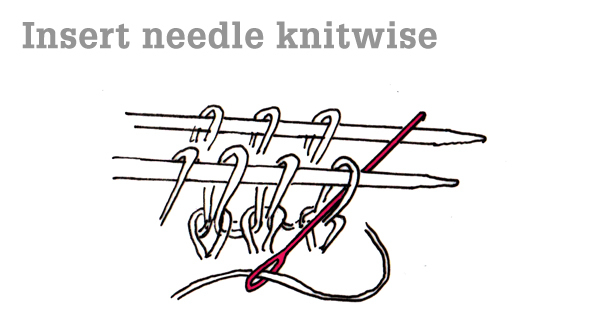 This illustration shows how needle is inserted in a ‘knitwise’ direction – it is shown on the front needle for clarity, but it works the same on the back needle. Step 1: put your darning needle through the first stitch on the front needle knitwise, thread your yarn through, and slip that stitch off the needle. Step 2: put your darning needle through the next stitch on the front needle purlwise, thread your yarn through, and leave the stitch on the needle. Step 3: put your darning needle through the first stitch on the back needle purlwise, thread your yarn through, and slip that stitch off the needle. Step 4: put your darning needle through the next stitch on the back needle knitwise, thread your yarn through, and leave the stitch on the needle. Repeat steps 1-4 until 1 stitch remains on each needle, then work steps 1 and 3 one more time. I also like to keep a little hand-written cue card with the steps in my knitting kit, to refer to when I need to graft a sock toe! Once you have threaded the yarn through all of the stitches, you should use a little blunt needle tip to gently and carefully tighten up the stitches one at a time, before weaving in your ends! Adorable free Pattern: Rye Socks – check it out! Finished my First Ever Sock! Baby Squirrel. Thank you SO MUCH! I have made about ten pairs of socks now, and this is the first time I’ve been able to finish by grafting. No other tutorial had helped before! Everybody’s toes will be much happier, now. BTW the Rye socks are absolutely addictive. thanks for sharing this detailed tutorial! I will print it and keep it in my project bag! Never enough pictures for me:) Why are socks so difficult for some people (me). I keep trying but am not satisfied with my work. Thanks again! How does one combine in Kitchener stitch in a knit-purl ribbing pattern? I don’t understand where the yarn goes in the Kitchener stitch. I see how to insert the needle for knit and purl, but the yarn ends up wrapping all over the place! Hi Pamela – the yarn is going through the sts the same way the needle is, following the same path. The important thing is not having the yarn go OVER the needle (that will create an extra stitch). OK. That should help. I’ll try again! We don’t yet have it in PDF form, but if you hit file -> print it should print out the blog post for ya! Thank you for your very clear Grafting instructions. I have just successfully grafted my first sock toe! ever so slightly bumpy at the corners, but otherwise surprisingly neat. I am soooo pleased. Thank you so much for the pattern! I’ve just finished my first sock. Simply love it! Please, can you translate in french because I don’t anderstand all you said; I am too old (73 years)!!!! If only I knew enough French to do it! Ramamonjisoa, I just did a search using google: “kitchener, francais”. It found several picture guides and videos.